Hamilton May offers a 4-bedroom apartment available for sale - the property belongs to the Mozarta Settlement in Kraków. Hamilton May presents a unique opportunity to purchase an entire floor of a superbly located building, sitting at Grodzka street, in the very heart of Krakow. 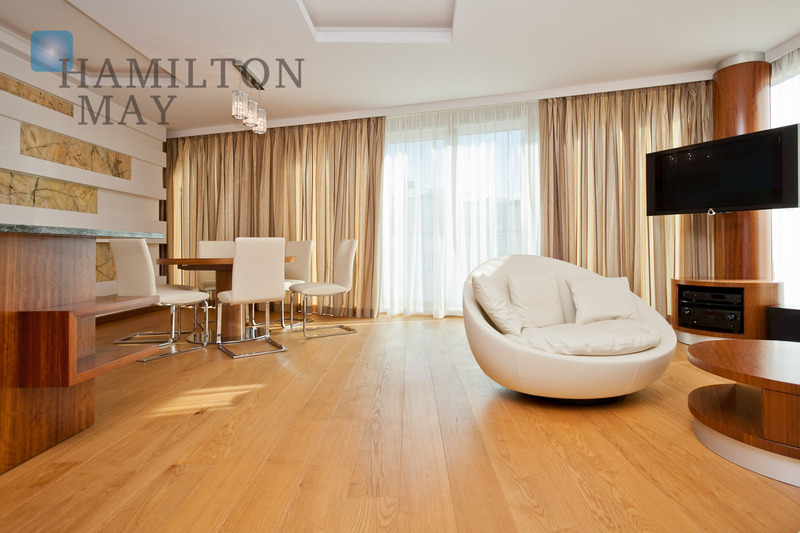 Hamilton May presents an apartment in the developer's standard, located on the 2nd floor of a modern investment at Różana street. Hamilton May would like to present for sale a luxurious duplex apartment, located in a quiet and leafy residential suburb located west of the center of Krakow - Wola Justowska, ul. Wiosenna. Hamilton May presents a spacious apartment available for sale in a townhouse in the very center of Kraków - just 500 meters from the Main Market Square. Hamilton May is pleased to present a luxurious, 2-story apartment available for sale in a very attractive, recently developed investment in Wola Justowska. Hamilton May offers a four bedroom apartment in a new building from 2015 close to Wola Justowska district in Kraków. Hamilton May is pleased to present two modern and entirely renovated apartments connected by a common hallway, located just a short stroll away from the Main Square, on Studencka street. Four bedroom apartments are generally scarce in Krakow, as most apartments made for the local market have a smaller configuration. Nevertheless, Hamilton May has responded to demand for such large apartments, mostly from expat tenants, and can source four bedroom apartments in various areas of Krakow. An apartment with four bedrooms is referred to in Polish as a five room apartment, with no distinction as in English between a living room and a bedroom. Some rooms in Polish apartments often serve a dual purpose, such as a living area or study during the day and a bedroom at night. The standard size of a four bedroom apartment in Krakow is approximately 120-150 square metres, though developers have recently begun offering new apartments in the range of 80-120 square metres with this layout. Some older style apartments will also have four bedrooms, but with an overall compact size and very small room dimensions. Occasionally, larger apartments (often in older tenement buildings) will be between in excess of 150 square metres with a four bedroom layout and very large room sizes. Due to the increasing demand for four bedroom apartments available in Krakow, Hamilton May always sourced such apartments for sale, despite their relative scarcity. Four bedroom apartments can be purchased in all parts of Krakow, from the old town to the suburbs, and in various standards, from basic to luxurious. The price for four bedroom apartments is determined more by the location and standard of the apartment rather than the size. In general, four bed apartments in high standard buildings in central Krakow are priced in excess of 1m PLN, though they may be cheaper in the suburbs. A viable alternative for some buyers in Krakow is to purchase a house rather than a four bedroom apartment, though houses will generally be out in the suburbs and some buyers wish to have an apartment in the city centre within walking distance of amenities and sights. In most modern developments, buyers of four bedroom apartments will also be able to purchase at least one protected parking space with their apartment.